Forum software is designed for community and collaboration. Forum software allows you to capture and share knowledge, discover new innovative ideas, discover customer support inquiries, all within a social platform. Businesses are fueled by the generated ideas discussions and suggestions that come from their customers and forum software provides a basis for improvement. In today’s socially driven world, we find ourselves smack dab in the middle of a social revolution- where the main focus is enhanced customer engagement. Today, consumers are empowered and are not afraid to express their opinions and share their ideas via the social web. Forum software is designed on this basic principal and provides customers with an outlet for them to share, discuss and elaborate upon ideas, opinions and inquiries. Many companies use forum software to engage with their visitors, and that’s a great start. As a company your goal is to produce services and products that will surprise and delight your customers. Often times ideas and suggestions are properly collected but then fall through the cracks due to a lack of a system in place that integrates them into the development process. Simply adding forum software is not enough- you need a sophisticated tool that will help you not only listen fully engage and interact with your customers but a tool that will also allow you to push all of that insightful feedback and useful suggestions through the product and service development process to take action and deliver better products and services. OneDesk provides the tools you need to engage with your customers. 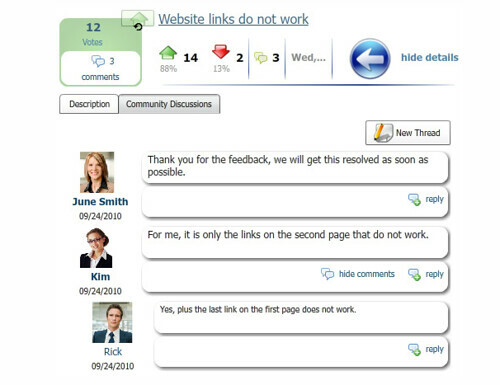 Like forum software, you can build a customer community through OneDesk’s customer portal: a platform from which you can interact with your customers, capture their ideas and suggestions, clarify and elaborate upon them, as well as a place where customers can also bounce their ideas off other customers within the community. But is more than just forum software- its full suite of project and product development tools ensure that you are fully integrating this valuable insight into your product and service development process and aligning your corporate goals with the needs of the marketplace. OneDesk recognizes that online collaboration helps to increase revenues, decrease operational costs and helps you gain a competitive advantage over your competition.